Help spread the word with Free Irwin Schiff items. 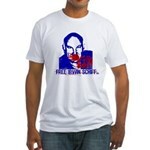 All proceeds go to the effort to Free Irwin from political imprisonment. An American hero who fought for your rights is being held as a political prisoner by your own federal government. Irwin Schiff discovered many loopholes in the IRS code that would have meant most people are not subject to income tax at all. The IRS tried to ban his book, but when they were unsuccessful, they threw him in prison to keep him quiet. Judge Robert Dawson did not give Schiff a fair trial. Schiff was not allowed to present witnesses, and the IRS could not even distinctly define what statute he was in violation of. Schiff is now being held a political prisoner for exercising his freedom of speech, exposing what could be the biggest scam this country has ever seen. UPDATE: In a sad turn of events, Irwin Schiff has passed while in federal custody. He was not allowed to see his family in his final moments. I am leaving this site up to provide information about Irwin and his discoveries. The collection, harassment, and the lack of due process is completely unconstitutional. There is a clause in the constitution that guarantees that we will not be deprived of life, liberty or property without due process. However, every day, the IRS violates this clause. Without the check system of a court, without a fair hearing, and trial by jury, the IRS can declare that according to their calculations, you owe money, and they will confiscate your property and throw you in jail. It's a shoot first and ask questions later mentality, that is costing thousands of American's their livelihood every year. While this may be of no potential consequence to you, because you are paying your taxes - consider the consequences of allowing this to continue. As the level of taxes rise, more people protest the IRS, cheat on the amount they owe, or refuse to pay them altogether. These people are put in jail, or more is taken from them in physical property than the amount the IRS claims they owe. The next time the taxes are raised, half of the people who would stand to protest are already out of the way, making it easier for washing to raise the tax. By the time the tax is raised to some percent that YOU consider outrageous, the people who protested before have given up or are in jail, and the others will refuse to help you protest, because the percentage is not high enough to effect them yet. We need to put checks and balances back into place and put an end to this outrageous money wasting Washington policy. A few days before writing this, Joseph Stack crashed his plane into the IRS building. Now we can't say that we agree with resorting to violence, but as he wrote in his suicide note, violence was his final resort. We have seen how malicious the IRS can be. You are guilty until proven innocent. There is no due process. They will take everything you have overnight, not accounting for one thing. Taking everything and leaving you with nothing means that you are left with 0% of your income. But how is this be when the tax rate is only 10 to 35%? Everything that this man had worked for all his life was being taken away. The IRS is relentless, and refuses to compromise and leave him at least enough to survive with. The media is not helping the situation. You can scour the internet for video clips and newspaper articles, and you will only find journalists calling him crazy for thinking he could get away with not paying his tax. They call him a terrorist. When the british came to america to attack the colonies, i'm sure that they would have called the colonists terrorists also. This was not an act of terror. This was a violent attack in self defense after all other remedies had been exhausted. Again, we do not support his decision, but it should not be recognized as an act of terrorism. What I can say is that I am angry. Not because he attacked the IRS, but because the IRS drove him to such a stressful and traumatic place, that he would decide to take his own life to make a statement of this magnitude. We can also be upset that his statement was made only to be swept under the carpet by the media so that we would focus on an apology from Tiger Woods - something that is truly irrelevant to our daily lives.